In the previous article, I have study the way to power this large VFD, now we gonna take a look closer at the logic itself. We need to drive a lot of bits (8+9) at ~40v. After a little googling, I discover that Allegro still sell some VFD drivers, but they are really hard to buy, and only provide a small amout of outputs (in DIP package). It’s the first time I used the ATtiny2313, but AVR-GCC is a great tools so.. To program this little stuff, I used the in-circuit programming, check out tuxgraphics doc for more infos about the whole stuff. 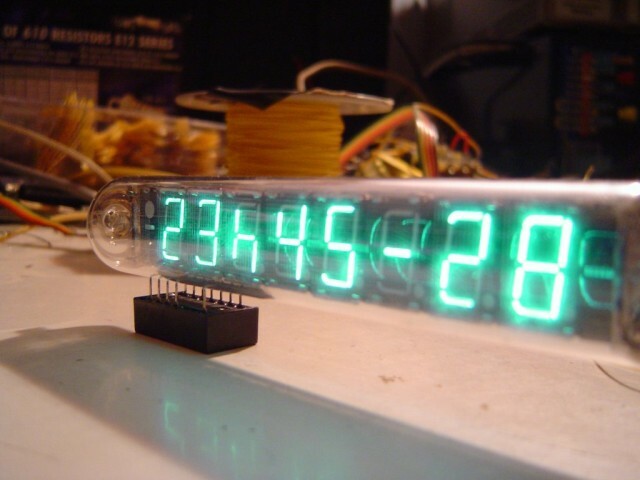 Nixie clock at home ? 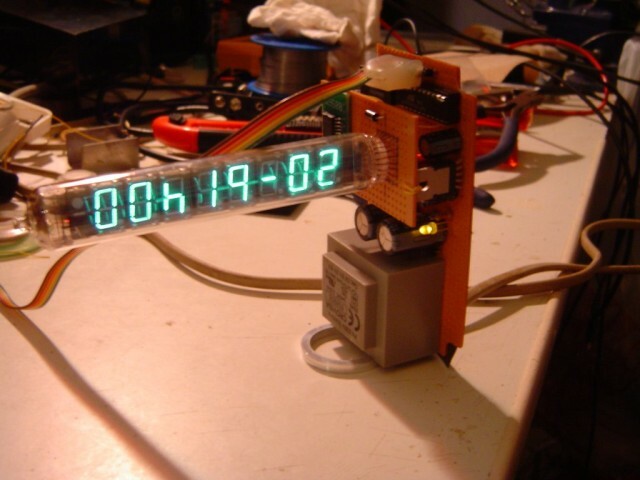 This entry was posted in Electronics and tagged avr, clock, diy, vfd by admin. Bookmark the permalink. can you post a photograph of the print with the SMD-chip? I am interested in the way that you connected that chip to the rest of the board. The SMD-chip use a adapter. This adapter is solder to the veroboard. I used some "wrapping wire" to connect the adapater to the vacuum and 4 wires between the mainboard and this one. I will try to make de picture soon. (Check out the video, you will see part of that part). And to finish, if enought people are interested I can will produce some PCB. Hey! Thanks for being so fast… a zip would be great… Us mechanical engineers shy away from this "unix" you speak of. If anyone want’s one of this, please get in contact with me. I just bought 12 tubes of this type and (obviously…) don’t need them all. I don’t want to make a profit out of this. Just cut the costs and avoid having to store 10 tubes. Yes AC for heater is better, but this won’t work on MAX6921 (no neg input) ..
Have you the microcontroller´s program in a separated text ? Jordan please open the file with Winzip, as it’s archive compressed file..
Super! I’m interested in the PCB, what would one piece cost? I’m still confused. The entire schematic/circuit consists of the power supply circuit and the uC controller section (max921,attiny2313 and the ds32khz)? Anything else (besides the tube)? What was the reason not using a wallwart? Do you have a copy of the spec for the IV-18 tube and could I get a copy of it? I’m not an EE, but with such a low component count it would not be too diffcult to build one of these, just programming the attinywould be my hurdle. I have the same problem with the TAR. I would appreciate a .zip too if possible. Any news on the pcb design ? If it ever gets designed im interested in some. 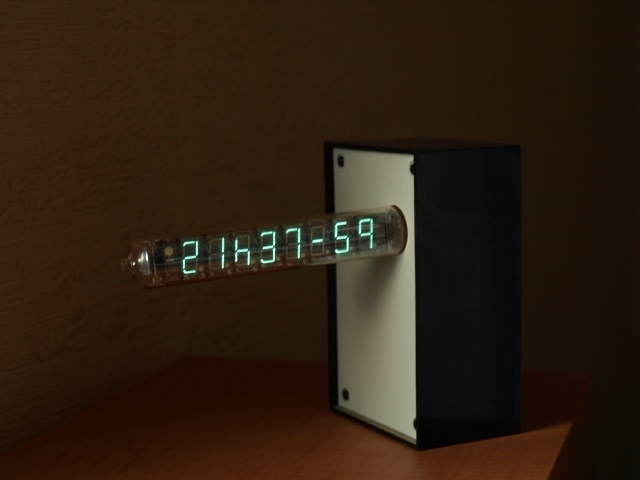 I’ve just built up a version of this clock and it looks great and works very well. – It uses a 9V DC plug pack. 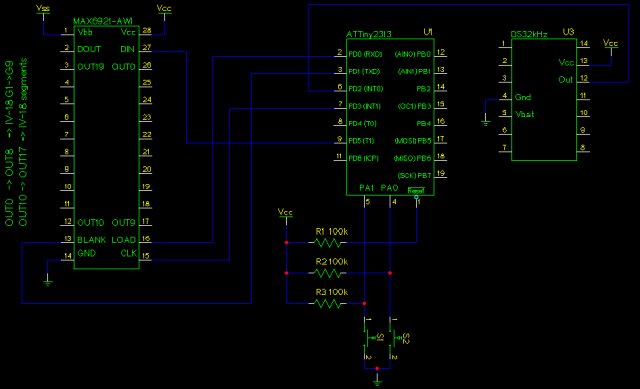 – Because of this, it uses a switchmode boost converter to generate ~40V for the VFD anodes. – I used a MAX787 for the 5V power supply, because that’s what I had on hand. – I’ve used an ordinary watch crystal, trimming capacitor and a CD4060 in place of the DS32KHZ. When the DS32KHZ I have on order arrives, I’ll change back to your design since it will be more accurate. I’ve used your software, which works really well. I only had to change the segment (font) and digit arrays to suit my wiring of the IV-18 tube. However, I did notice what I think is an error on the schematic diagram. Namely, that the clock output from the DS32KHZ should go to pin 8 (PD4/T0) on the ATTiny2313, not pin 6 (PD2/INT0) as it is drawn above. Before making this change the clock advanced the seconds very slowly and sporadically. Now it works perfectly. However, this change might only have been required because I am using a different clock generator, as noted above. Thanks for taking the time to post up this design. It’s a really neat project. I changed the clock a couple of times, so perhaps there is a bug in. I need to post more photos on this clock too. Is the only file I need to program the Attiny2313 main.hex? All other files were just for your testing and not necesary for me? brivapor, please be a little more precise. Feel free to contact me over IRC or MSN to talk. also is that a (not)Vcc in the pin 1 reset? Hello jkx. I have bought itron IV-18. I want to make a clock like you have. But I´m not electromechanic. I thought, that I make PCB and plug the parts, but I found that I must programate Attiny 2313. It is unbeatable problem for me. I realy don´t know nothing about this dilemma. Can you tell me some advices? PS: I can´t open “iv18-clock.gsch” . What is it in this file? PCB image? I have eagle software and it can´t open this file. Sorry for my english, Im from czechrepublic. To program the Tiny2313 you can use a simple parallel wringler. Why the schemmatic does not match to the code? Wrong input of 32kHz, wrong WFD wirings. Wery angrying and more hours spending project of nothing. Do not recomending this! fules: This is a file, believe me ! … read other comments you will understand .. Does somebody has de code in something other then a .gsch file . Because i’m currently working with windows and gpleda does’nt work on this . This is a really great project. I have 10 of the IV-18 tubes ready, but am having real trouble finding the other ICs. The MAX6921 VFD driver and the DS32KHz are really hard to source in the UK. Would be really great to have a seller (maybe eBay) that has packs of each component for this build. At the moment, I am looking to get some parts from the US, and the rest from 2 different UK suppliers. Would love to hear from anyone else that has built (or is building) one of these.